Bettys. Yorkshire folk know what I’m talking about. 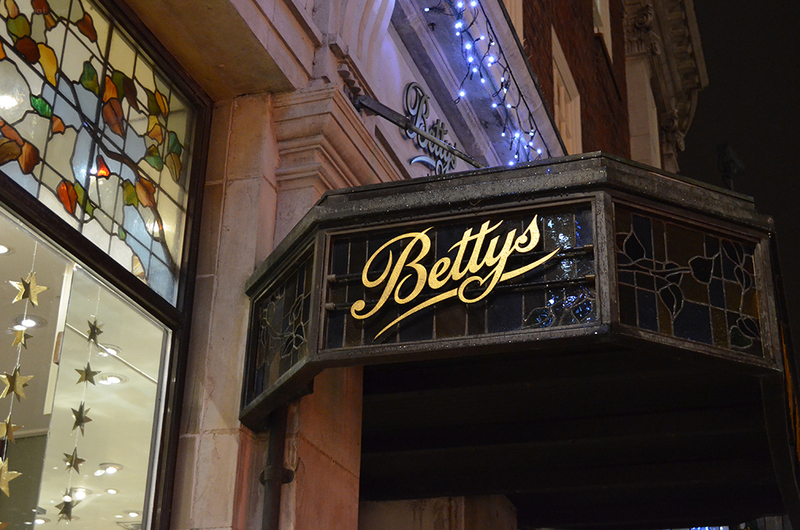 For those of you outside of God’s Own Country, Bettys is an absolute institution, . If you’ve ever visited the beautiful city of York, you’ve probably seen the snaking lines of people literally queuing out of the door to eat in Bettys tea room café. Their tea and coffee selection is amazing, and chances are you might well have tried their famous Yorkshire Tea or one of the fab Taylors of Harrogate coffees at some point in your life. 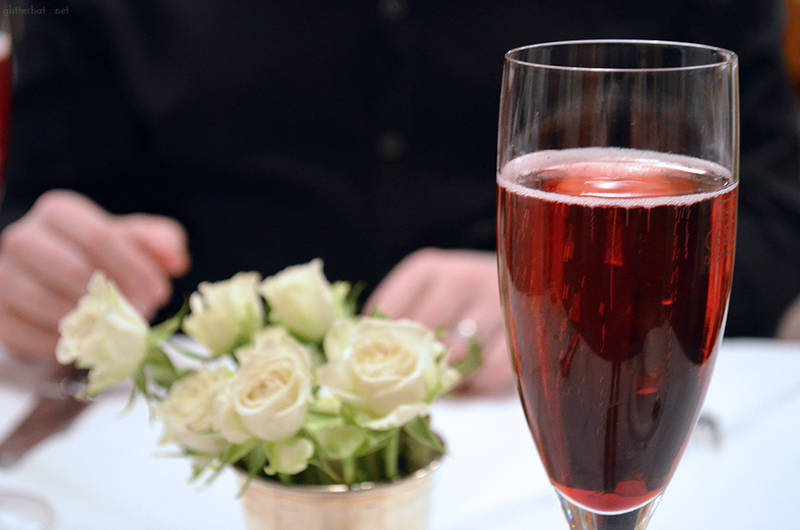 You can likely imagine my excitement when I was invited to review the new(ish) Lady Betty champagne afternoon tea! So on a very rainy Saturday, my lovely husband/tea connoisseur Dan and I headed over to York, excited to see what Bettys had in store. 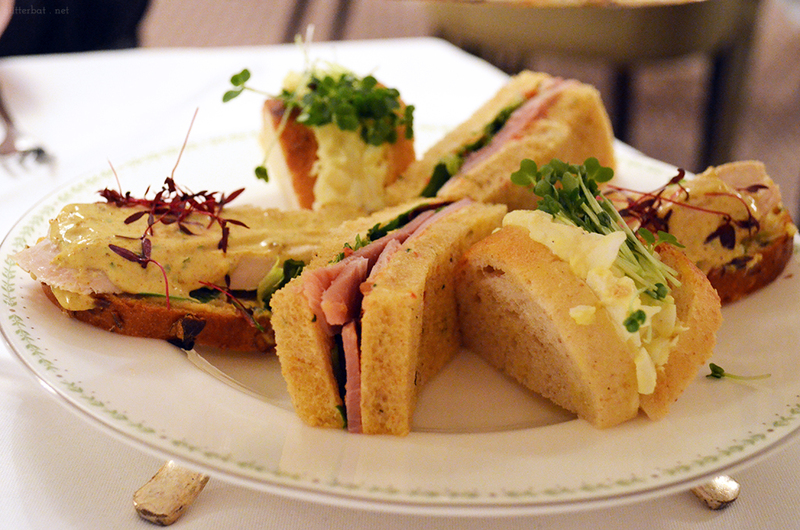 The Lady Betty afternoon tea is served above the bustle of the tea room downstairs, in the elegant Belmont Room. Everything has a quaint old timey vibe to it, from the broderie anglaise blouses of the waitresses to the charming deco styling of the room itself. There’s even a pianist playing softly, adding a sense of occasion and formality. That’s not to say it’s stuffy however, don’t get me wrong – everyone is incredibly friendly and warm, but you should expect that in Yorkshire really, shouldn’t you? Dan and I both opted for Kir Royale champagne cocktails as we perused the rather extensive tea menu. We’re both into tea of all kinds, so we were delighted to see such a good range on offer as part of the Lady Betty afternoon tea. If we’d been less tea savvy, there’s no doubt that our waitress would have helped us decide! Dan opted for a jasmine blossom green tea, and I went for the China rose petal black tea. 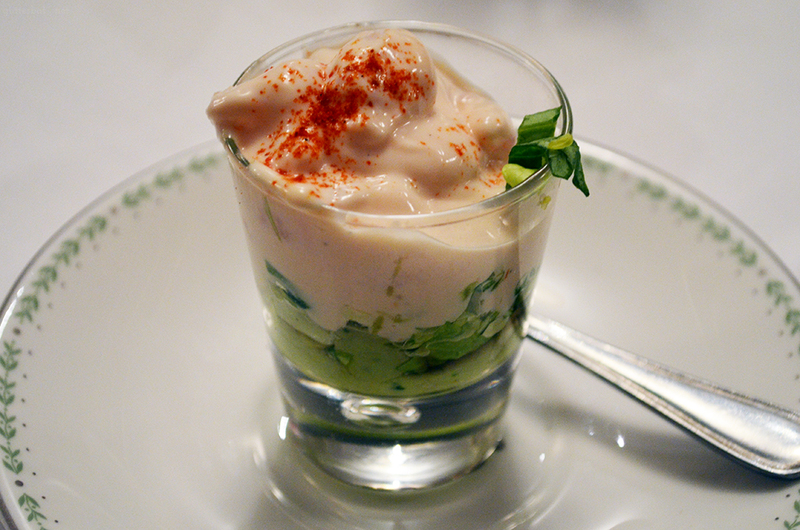 First we were brought prawn and avocado cocktails – tiny shot glasses filled with avocado purée, lettuce, and juicy prawns in a Marie Rose sauce with just a pinch of paprika. Gorgeous. Huge fan of prawns, especially when you add a bit of avocado! 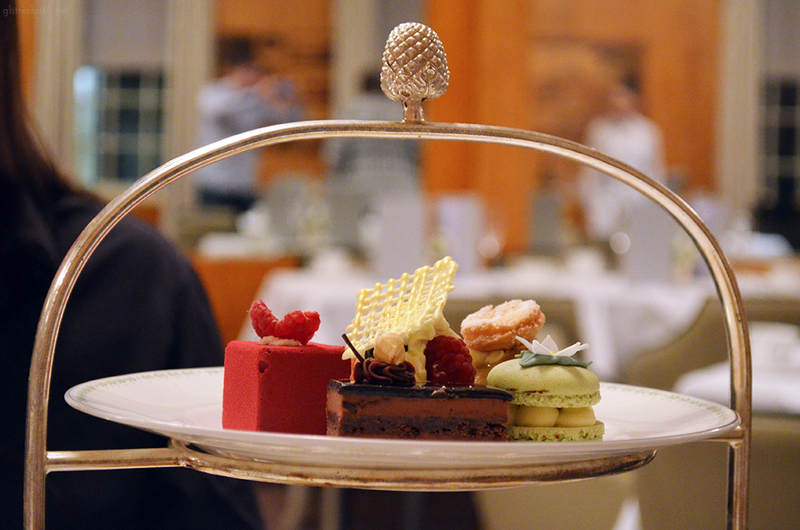 Then it was time for the main event… A silver tiered stand of pure joy was brought out, alongside tiny savouries. 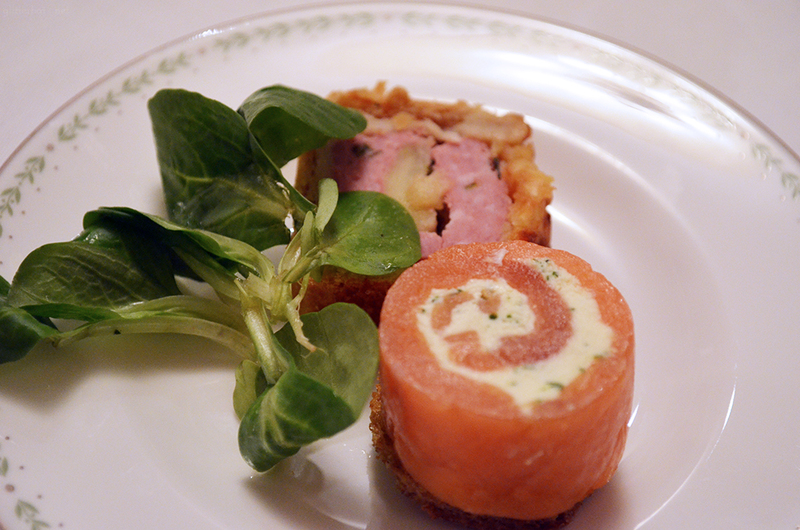 We had a miniature Yorkshire pork and apple pie, and a smoked salmon, cream cheese and dill roulade. Both excellent, as you’d expect. The bottom tier of the stand housed a trio of sandwiches… Coronation chicken on pumpkin seed bread, egg mayonnaise and cress on white sourdough, and roast Yorkshire ham and tomato on a sunblushed tomato bread. My favourite was the latter, mainly because the bread was exceptionally good. The coronation chicken was lush – no sad chunks of dubious chicken here, just a tender slice of chicken breast in just the right amount of dressing. Perfect. The egg sandwich was the weakest, and it was one of the nicest egg sandwiches I’ve ever had – it just didn’t have the same “ooooh!” factor as the other two. Tier two brought the afternoon tea staple – scones, jam and clotted cream. 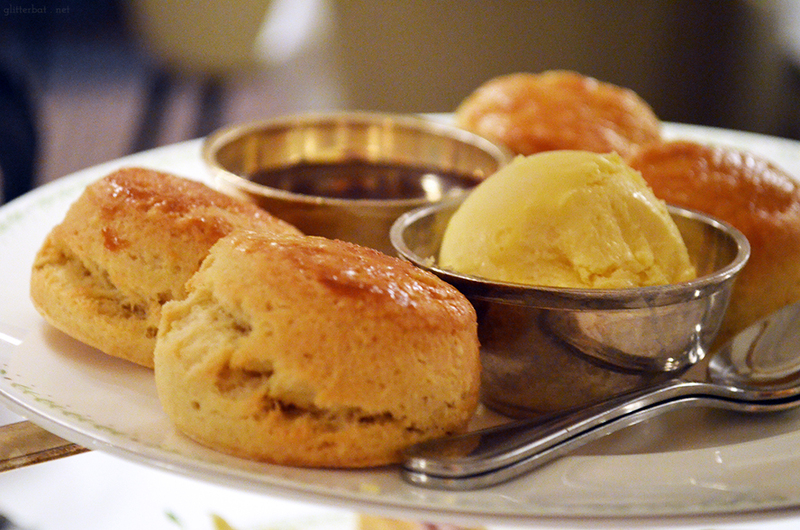 Bettys scones are baked fresh every day, and it shows. We each had two scones, small but perfectly formed, one with sultanas and the other delicately flavoured with (Yorkshire grown) lavender. It’s in the simple things like scones where Bettys quality really gets a chance to shine through, they were buttery little dreamboats. Feeling slightly full, but bravely soldiering on (I know, tough job) we started on the uppermost and fanciest tier. The beautifully presented miniature cakes consisted of: Grand Cru chocolate and raspberry square, apple caramel macaron, chocolate and praline slice, fresh berry meringue, miniature battenberg and a coffee religieuse. 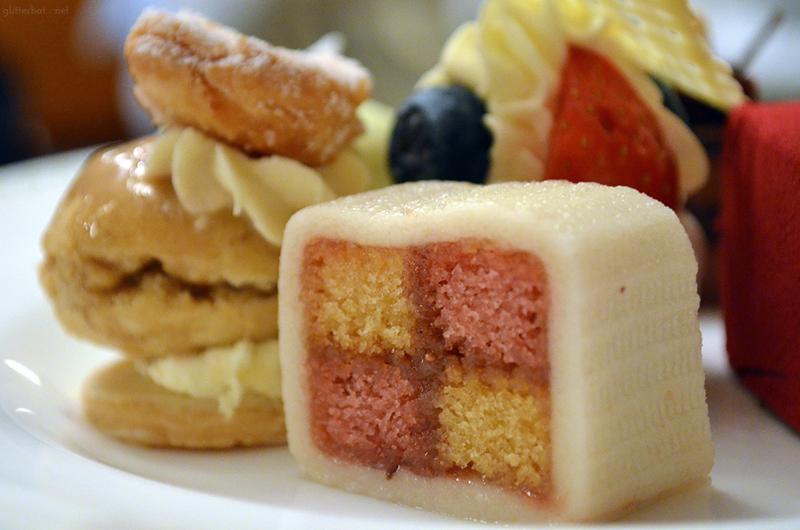 There was no fighting over the cakes, as we lovingly shared all six of them! I’m hard pushed to choose a favourite, as all the cakes were beautiful… If I had to choose a favourite though, I’d go with the chocolate and praline slice, mainly because of the incredibly rich hit of dark chocolate glaze. Turns out that one was Dan’s favourite too, with him citing the “amazing mix of textures”. Clearly we were meant to be! Stuffed and content, we were pleasantly surprised when our waitress brought us two tiny caddies of tea to take away with us. Before heading back to Leeds, we called into the shop downstairs to pick up bags of the China rose petal and green jasmine teas for home, along with a couple of bits from the bakery for the weekend. I’ve not stopped drinking the China rose petal tea since we came back – I think it could well be my new favourite. It’s incredibly fragrant, and so smooth… sheer perfection! Although the Lady Betty afternoon tea is on the expensive end of afternoon teas (£32.95 a head, or £39.95 with champagne) I would argue that it’s entirely worth it for a special occasion. The quality of Bettys food and drink is just so high, and the service is impeccable. 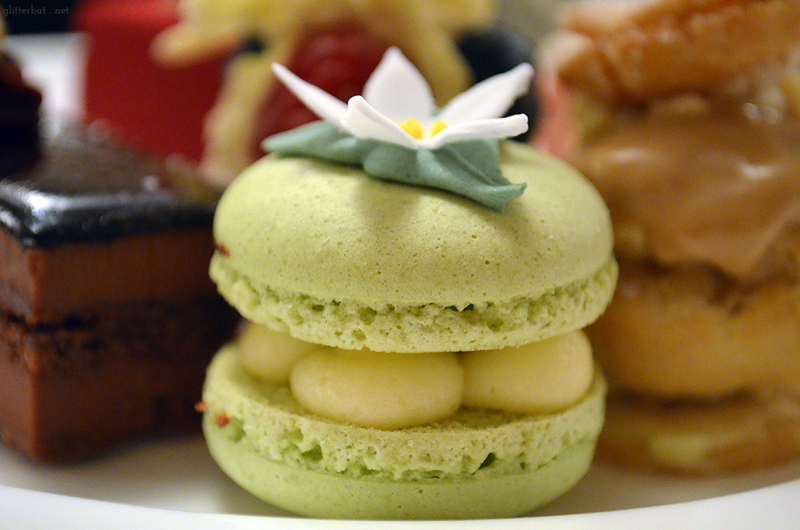 If you can’t quite stretch to the Lady Betty tea, definitely go try something from the bakery or their tea shop. You’ll be hooked, I promise! 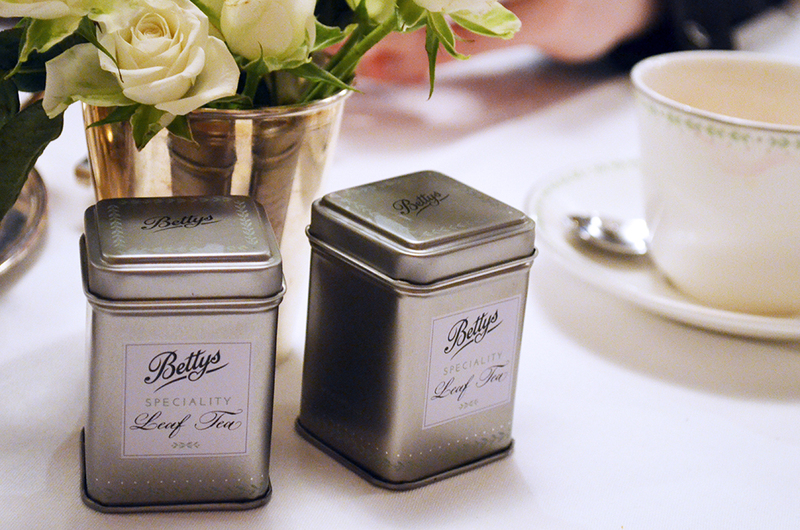 Lady Betty afternoon tea compliments of Bettys – compliments for the Lady Betty afternoon tea all my own. For more information see my disclaimer. I am so jealous I would have loved this, it is one of my fave places!